If I ever write a list of all my skills, birthday party planning would definitely be up there on the list. After planning a dozen or so parties for my children over the past eight years I consider myself quite well-versed on the topic. There are many things to consider when you arrange a birthday party so that it is fun for the kids, on budget and not too tiring for parents. Sharing all my tips for planning a birthday party for kids in Calgary that is memorable and fun. Consider the age of the child in deciding how many to invite. Make sure that the birthday child does not get overwhelmed if you invite too many. If the children are under 5-6, it’s best to invite parents along with the children. Invitations can be sent by setting up a Facebook event or sending an email if you have the contact details of the parents. Sometimes invitations have to be sent to school because you are not in touch with the parents. Even though you might have mentioned the RSVP information clearly on the invite, don’t expect all parents to get back to you. In order to avoid the situation where you aren’t sure who is confirmed, don’t mention the exact venue on the invitation card, only neighborhood, time and date etc. Give the venue information to all those who confirm. Based on the number of guests you can decide the venue: either home or a community center. While home is cheaper but a community hall gives you more space but keeps your house clean! Make sure you check with all guests when they confirm about allergies and set your menu according to that. Keep simple food options for children such as pizza, vegetables, fruit, chicken nuggets etc. While gifts are not expected, they are usually given at birthday parties. Here are some ideas to have a giving birthday if you wish to teach your child lessons in community giving and generosity. All children love to get party favors at the end of the party! You can tie favors to the party theme. If give candy in the party favors, be aware of any allergies in the guests. You can choose a party theme based on the age and interests of the child. We recently celebrated Zeynab’s birthday party with theme of fairy tale characters. Other popular themes are Sesame Street, Paw Patrol, Dora, rainbow, pirates, etc. Concentrate on setting up the cake table for greater impact rather than doing the whole room/hall. This is truly the crux of planning any birthday party! Especially when you are planning a birthday party for kids in Calgary, you have to be well aware of the weather. In the winters, you have to plan something indoors, but even for summers, you need to have a plan for indoors since it can be too windy outside or might rain! Over the past few years we have arranged many activities for the children, but the most fun recently has been the portable indoor playground and soft play structures by Sprog & Sprocket, a local Calgary family-run business. 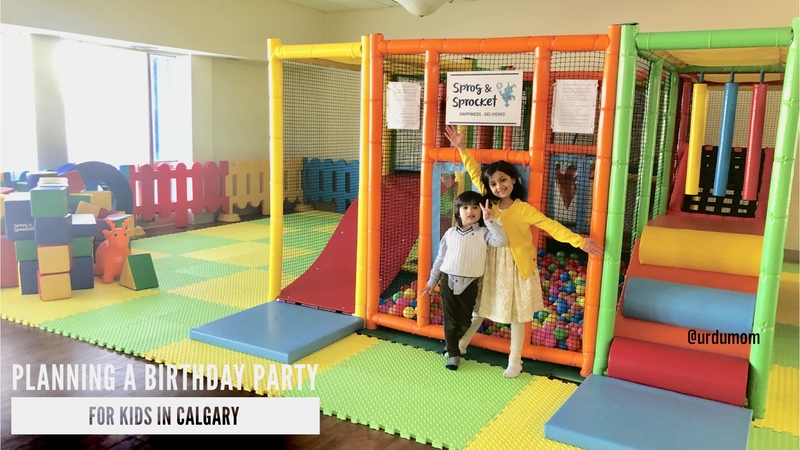 We had rented a hall in Calgary for Zeynab’s 8th birthday party and that’s where we had the indoor portable play ground and some soft play structures to cater to all the children who were invited. The husband and wife team at Sprog & Sprocket is extremely professional and committed to customer service. They go the extra mile to make sure that the children have the maximum fun. The set up and tear down is completely taken care of by Sprog & Sprocket. As a parent I was extremely impressed with the cleanliness and maintenance of the structures. They wash everything down to every ball in the ball pit in between rentals. The children had a great time! This was not just a play space for them, but they built towers, forts and used their imagination to play and create games. The experience was private and totally stress-free. As parents we did not have to constantly look for the children in a noisy public play area and could actually chat with each other. The kids enjoyed playing with their friends and not having to deal with a crowd. It was a win-win. Each one of our guests told us how much they enjoyed themselves and as for the children, just the fact that they did not want to leave, said it all! Sprog & Sprocket have various solutions for any birthday party for kids in Calgary such as their indoor portable play area and many soft play spaces that they create for younger children along with sensory tables and even party decor. You can use their service not just for birthday parties but also office parties and weddings, anywhere the little ones need to be entertained! They can create their play spaces not just in community centers but also the living room or basement of your own house (some size restrictions apply)! I have seen them transform some basements and back yards in Calgary into the most inspiring play spaces with their soft play structure. There is no end to their imagination. Please contact Sprog & Sprocket for your next party! Check out their website or call them at (403) 719 – 7776. Hope you enjoyed these tips to plan a birthday party for kids in Calgary! Do let me know if you have any questions. Disclaimer: The Sprog & Sprocket team gave us the rental experience as a gift. All opinions are my own. Previous Post Which Instant Pot to Buy and Other Frequently Asked Questions! This looks like a great party!! Great planning!! Based on the structure you had, how many kids can comfortably play in it? Thanks so much! The portable playground from Sprog & Sprocket accommodates 15-20 kids. Plus we had the additional soft play structures also. Hope this answers your question. Let me know if you have more! Awesome !! Its really amazing keep it up.